I do find it difficult socialising in crowds. My most enjoyable way of being with my friends is being with one or two at a time. Or at least, no more than, say eight. It has been said though that one really only needs six good friends, one to hold each handle of ones coffin when one dies. So it was kind of cool to sit with seven of my friends on Saturday, eat yummy food, and listen to a close personal friend of mine sing jazz. I so love creative people. It was nice to catch up with friends, old and new, put on a frock, and be a woman for a change, instead of a mum. Not that being a mum is not being a woman, but it is nice to be a woman without being a mum, occasionally, if only to sharpen other aspects of ones repertoire of behaviours. The Oscar thing. Well, as everyone in New Zealand knows each other being such a small place, most of us know at least a couple of the guys who won Lord of the Rings oscars. 😉 It so happens that one of the guys (who won one) brought along a genuine Oscar on Saturday and we ogled it and passed it around, and I happened to have my PDA (Zire 71) and got some pics. 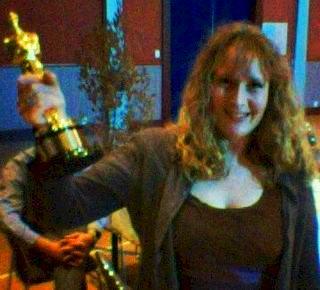 So I thought this post, with me holding the gorgeously firm and surprisingly heavy, gold-plated, serial-numbered Oscar statuette should aptly follow my other post about my Fun with Film-making.